The goal of investing is to make money for your future. Although investing sounds scary and hard, you will realize it really isn't once you learn more about how to do it. Historically, the stock market has returned about 7% a year on average. Meaning if you invest $1000 today, after 20 years you can expect to have about $3900. 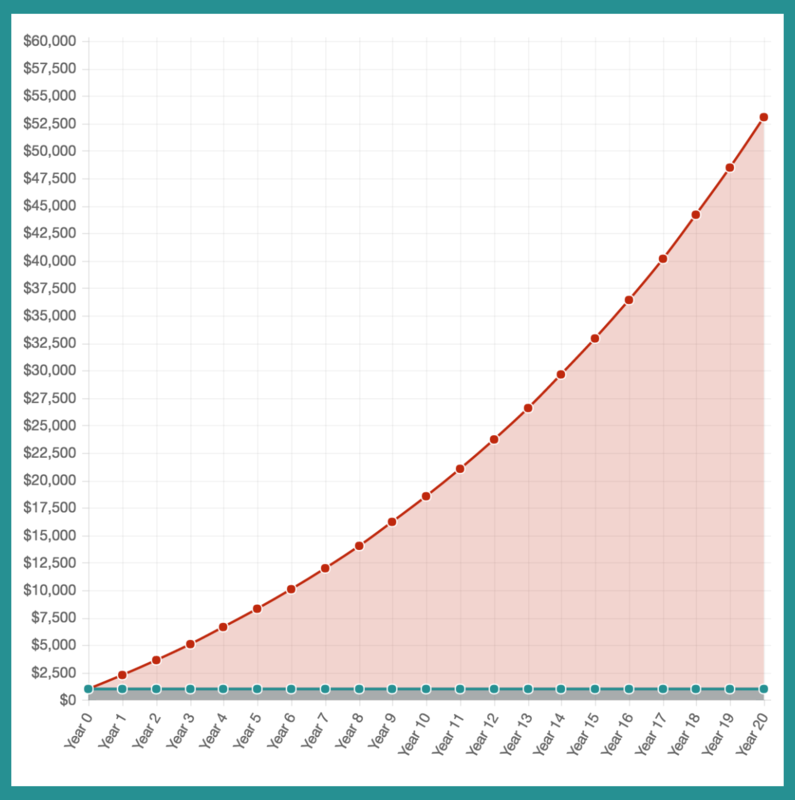 This amount goes up to $53k if you also add $100 every month to your original investment. Compare that to the 1% or less you would earn by keeping your money in a savings account. The stock market does fluctuate from year to year and while it is expected to return about 7% a year on average there will definitely be years where your investments go down as we saw in the recession of 2007–09. However, over time the stock market should go back up to average about 7% returns a year and in fact, the stock market has already recovered from the crash of 2007–09. Because the stock market can fluctuate from year to year, if you invest today, after one year you could be up 20% or down 20%. To have the best chance of your investment being up you should be investing over a 10+ year period. The good thing about stocks compared to other illiquid investments is that you can cash out whenever you want. If you need money for whatever reason, you can sell your stock and transfer money back to your bank account. There’s just no guarantee that you will have made money unless you invest over a long enough time period. At least $10-$20. Once you have an emergency fund saved up and no debts to pay off, you can start investing with excess money. Some stock brokers offer fractional shares so you don’t need enough money to buy a full share of a company to start investing (more on that below). It’s important to pay off debt before investing unless you are certain that you can make more from your investments than you are losing by paying interest on your debt. This is buying stock in individual companies such as McDonald’s or Facebook or Google at a stock broker. A stock broker is a service that allows you to purchase stock in companies. Buying individual stocks is the higher risk option because your portfolio will lack diversification. A really good or bad performing stock can affect the performance of your entire portfolio. We recommend using Robinhood as your first stock broker if you want to start doing this because it is completely free. Most stock brokers will charge you between $5–10 to buy a stock and if you’re just starting out with a small amount of money, paying a fee for every trade is not worth it. Say you want to buy shares in Google but each share is $800 and you only want to invest $200. In that case you will need a stock broker that offers fractional shares. We recommend Motif if you wish to do this because they offer fractional shares and buying up to 30 stocks is only a $10 fee. You can think of an ETF as a whole bunch of stocks in one. For example, a very popular ETF is VTI which stands for Vanguard Total Stock Market ETF. By buying this one ETF you are essentially investing in the entire US stock market so your returns will also closely resemble those of the US stock market which are about 7% a year as mentioned earlier. This is a lower risk option because a bad performing stock will not affect the performance of your overall portfolio as much. You would think that this means worse performance when compared to picking your own stocks but studies have shown that only 1% of active traders manage to beat the performance of the overall stock market. The best option for purchasing ETFs is using a robo-advisor. A robo-advisor automatically purchases a balanced portfolio of ETFs for you for free or at low cost. If you wish to do this, we recommend WiseBanyan because it is completely free and offers fractional shares of ETFs. All the robo-advisors in our comparison here are good choices. You can also purchase ETFs yourself at regular stock brokers. Robinhood would be a good choice here again but we recommend Vanguard if you want to go this route because they offer really low fee ETFs and buying Vanguard funds on Vanguard is free. As for which ETFs/Index Funds to buy, we recommend a lazy portfolio or Vanguard's Target Retirement Funds which gives you a complete portfolio in a single fund or Vanguard's LifeStrategy Funds which also gives you a complete portfolio but you can pick your own allocation of stocks and bonds. Are there investments I can make outside of stocks? Other investments categories include p2p lending, real estate, and equity crowdfunding but they are for once you have more experience and want extra diversification. When it comes to investing, we think the stock market offers the best balance between risk, return and effort involved.